“Base-building” has become an empty buzzword. Like other members of the Marxist Center tendency, I believe socialists today need to prioritize building independent, mass organizations, establishing new bases for revolutionary action down the line. But while many socialists already believe they should be doing this work, few engage in it. I hope this and a few follow-up pieces gives you a flavor for what it’s been like organizing in, with, and for the working class without relying on anyone but our small, local socialist collective—in the hopes that you think about taking up the job. It’s been inspiring and satisfying work. It’s also been draining and contentious. We’ve had our fair share of interpersonal conflicts. But we’ve built real power. We’ve done the hard work of living out solidarity and mutually transformative relationships. As a personal take on a collective endeavor, this account will lack some key details and take particular positions. I submit it to you as nothing more than one organizer’s experience. I hope you, a current or would-be socialist organizer, find some value in it. We do this work together, but we experience many of its challenges alone. The point is, my politics were already changing rapidly when I got to Philly. My friends and I were radicalizing but still completely clueless about what, if anything, we could do with our new insights. I remember, for instance, trying to get my roommates to watch a feed of the 2012 presidential debate that spliced in Jill Stein and whoever was the Libertarian candidate that year. I met a couple UNITE HERE organizers at a bar and they tried to channel my energy into salting. They got me and my friend to do some unpaid labor and run a huge petition drive on Penn’s campus. So I continued reading books about labor history and its radical potential, as well as Jacobin, and one day I googled “philly socialists,” just to see what was around. I watched a video where someone described the PS organizing model and went to a reading group. It was fine, but I really wanted to devote my time to class struggle–organizing a union, beating a boss, whatever. The first members and leaders of Philly Socialists had already established “Serve the People” programs à la the Black Panther Party—free internet, food distribution, and ESL classes. These programs were never meant to be ends in themselves, though. From the beginning the idea was to build the capacity to do even more. By 2012 the group had built up a small core of dedicated members carrying out programs and dedicating their time to establishing a positive organizational culture with social events. That’s when I joined. Tim Horras, then chair of PS, turned me on to the Seattle Solidarity Network (SeaSol) in 2013. They solicited people who had problems with their boss or landlord and helped them win concrete demands by doing escalating direct action campaigns. The idea was to build a “network” of people who bought into the power of collective struggle and would stick around for future fights. The calls started rolling in. Following SeaSol’s advice, we looked for fights that we could win and where the person calling was committed. That is, we looked for fights where it seemed realistic the targeted party would meet our demands and that the person who called us would be able actively to participate. The “selection” process is a numbers game. Sometimes only a few people will call. Most people you talk to on the phone won’t end up wanting to meet—or won’t show up to a meeting you set up. Not everyone you meet with will want to take the risk of working with you. Eventually we found someone who did. Adina had only recently moved from Atlanta but had already been screwed every which way by her landlord, Darren Hart. The place wasn’t ready when she got to Philly. But since he’d led her to believe it would be, he set her up at a motel way across town from where she’d already travelled across the country to work. Even after the unit was “done” and she was able to sleep there, she still couldn’t get her mail for weeks. Then the mice arrived. And arrived. The infestation was so bad that she literally lost sleep. They’d wake her every night running over her body. If she ever left out a piece of clothing, she would come home and find it destroyed, completely chewed through. Adina and I talked for a long time. We talked about life, about the problems she had with the nonprofits where she’d built a career. We talked about Philly, and about what we were hoping to accomplish with this solidarity network. I explained to her that we’d never done a campaign like this before, that we were operating based on what we’d learned from the experiences of a group in Seattle. I explained to her that none of us were lawyers, and that we weren’t trying—let alone able—to be a social services agency. Instead, we wanted to build the power of workers and tenants, to beat our oppressors by uniting together. What we did have, I said, was a small group of dedicated people willing and able to have her back. We had people who would show up for a direct action, who could help us research and strategize, who could use design software, run to the print shop, etc. I told her we couldn’t make any guarantees. I didn’t know if we would succeed, but believed we could. I also believed that any success she had would inspire other tenants to stand up and fight back, too. I asked her, what will happen if you don’t stand up and fight this guy? Even if you’re able to find another, different place, what happens to the next tenants? And will your new landlord really be all that different? She decided to take a chance on us. We set to work researching the landlord, Darren Hart. First we found his wedding notification in the New York Times. As it happened, he and Adina had both attended Morehouse, an historically black college. We planned possible tactics with Adina, five or six of us meeting in the home of two other West Philly members. Adina was extremely cautious and told us she wanted to take it slowly. But when months passed and nothing changed, she was ready to go. We prepared for the first in a series of escalating actions. At first, other than owning Adina’s home, Hart seemed to have only one other concrete connection to Philadelphia: a law firm he hired to evict tenants. This wasn’t ideal. SeaSol recommended activists select sites to deliver demands that had closer connections to the target—businesses the boss or landlord had connections with, their homes, their places of worship. Plus, Hart’s lawyer, we learned, had been the treasurer of then-Mayor Nutter’s first mayoral campaign. We didn’t want to make such a powerful enemy with so little experience and power. But this firm was the best place we could find. Adina honed in on exactly what she wanted as restitution: $300 to compensate her for clothing lost to the mice and immediate repairs to her bathroom. We drafted up a “demand letter” along the lines recommended by SeaSol: saying who we were, listing our demands, and making clear that we expected to hear back within a week. We hadn’t put together a protest before, and, looking back, logistical decisions that seem intuitive to us now were all difficult. Deciding whether to keep the details secret or public, where to tell people to gather, what to say in phone calls to supporters, who should speak to the people who showed up, etc.—none of these tactical questions actually matter very much, but we were worked up over them. When Adina told us a day before that she would have to push the action back an hour, for instance, my stomach dropped. I felt like all was lost, that the supporters who committed to coming out would all abandon us and accuse us of being poorly organized. None of that happened, of course, and cooler heads—who reminded us that “the first casualty of a battle is the plan of attack”—prevailed. We set the meet-up spot at a corner without storefronts a few blocks from Hart’s law firm. I was sick with nerves as people arrived and did my best to make the rounds, make people feel welcomed, convey that there was a solid plan in place. As I would come to feel at many actions I’ve led, I suddenly felt deeply embarrassed. Why should anyone here listen to me? I’ve never done this before! Everyone can see how incompetent I am. Who knows if this would work? Why didn’t we pick a different way to begin? 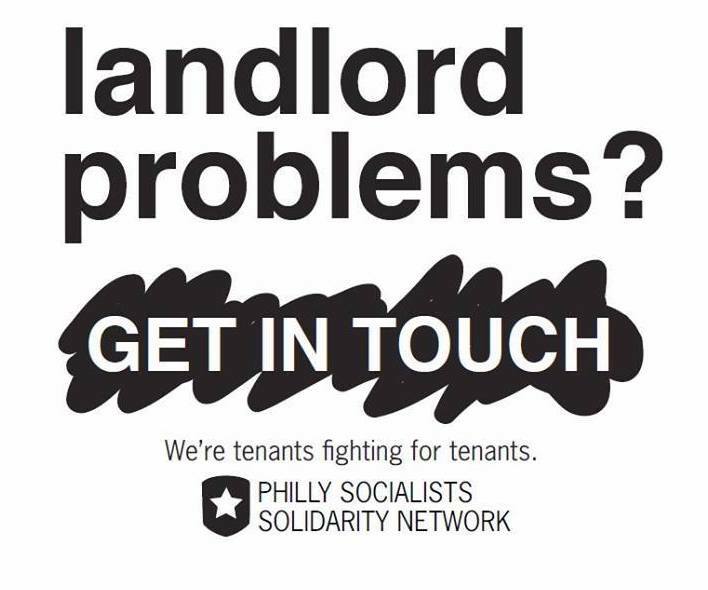 Does this all look pathetic to my friends outside Philly Socialists who I recruited to come? Was it smart to tell people not to bring signs, as Adina had requested? Don’t protests always have signs?! I got some perspective back when Adina arrived. I could see that she was nervous too. Wanting her to feel good took my mind off myself. After a few speeches from members, we marched over to the address we had for the law firm. But it had moved! I was flooded with shame again. I’d just led twenty people to a pointless action because we’d been too stupid to case our target spot before going there. I felt myself shutting down. As I started to give up, one of our group asked the receptionist where the firm moved to, and for some reason, she told us the exact address. It was down the street. The twenty of us walked over, sent in our predetermined group of four to drop off the letter, met a paralegal in the foyer who said the lawyer couldn’t come down, and left. It was scary. I didn’t know if the police would show up and claim we were doing something illegal or what. I didn’t know if Adina would be spooked by doing something so confrontational. And it was one of the first of many times I felt disappointed in my individual and our collective efforts. I had expected a much bigger turnout. We didn’t hear from the landlord within the time we had given him, so we got our next action ready: flyering about the facts of Adina’s case at all his other properties, which we had found on the city’s website. When the flyers went up, Adina finally heard back. For the first time, he was trying to get in touch with her. Adina was scared. We talked over strategy for how to have contact with the landlord. I wanted Adina to include someone from Philly Socialists on the call; she decided to go it alone. But Adina held her ground. Darren Hart’s talk was all bluster—he probably knew as well as we did that his connections to politicians were in fact weaknesses we could exploit by putting pressure on them. He ended up calling her back and telling her he would give in, so long as we pulled down the flyers. We felt good. Adina felt good. It worked. He paid Adina $300 for the clothes the mice had ruined. He fixed Adina’s bathroom mirror and toilet. This effort involved lots of people making sacrifices. But the most important and time-consuming work was getting to know Adina, building trust, learning from each other, and following through on every single commitment we made to her. This, I think, is the thing people have the hardest time getting about this kind of work. Showing up is not enough. Participating in meetings is not enough. Helping with logistics is not enough. When we’re talking about organizing people who are not in political organizations into a political organization, lighting a fire under them that will make them burn for social justice, it’s a huge investment of time. You are basically committing to building a deep friendship with boundaries, becoming true comrades, in a short period of time. This is the most emotionally draining component of the work. The amount of time you put in rarely feels commensurate with what you get out. This is the stuff people aren’t prepared for, and it’s the reason people even now will start to get involved and then step back after a couple months. But to get something like this rolling, you need at least one person willing to take this on. I can understand the pessimism. You look around at people’s level of commitment, it doesn’t look like much. You have to be realistic. Most people only commit a few hours a month. But with one or two people willing to put big stuff in their lives on hold for a while, you can make use of all those people’s hours and build something powerful. If we don’t do it, we’re consigned to following the lead of those who will—and their politics are usually not ours. As we moved on from this fight, we found that a struggle-only formation, or “solidarity network,” was not working. It couldn’t offer people what actually keeps them coming around after the temporary burst of energy in the fight: a collective life and group identity, delineated roles and clear leadership opportunities. We started putting it all together once we met the tenants at the Winchester in West Philadelphia.